Max Verstappen has been given a "gentle warning" about his driving in the wake of his controversial behaviour in the Belgian Grand Prix. FIA F1 director Charlie Whiting called in Verstappen for a discussion on Friday ahead of the Italian Grand Prix. Red Bull team boss Christian Horner said Whiting had told Verstappen he risked disqualification. "Charlie was keen to show him a video of Spa. It was a gentle warning," Horner said. "Like any 18-year-old the criticism [from other drivers] seems to be going in one ear and out the other. He really doesn't care. "We're all here talking about it and it's that spirit he's got that is bringing fans trackside." Read more: Is rising star Verstappen too reckless? 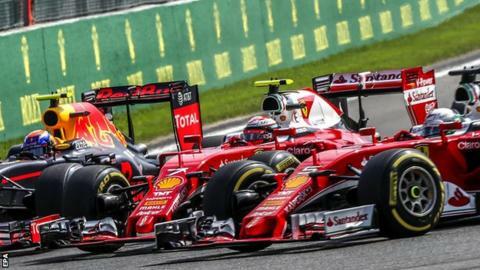 The meeting follows a series of aggressive defensive moves by Verstappen this season, which has led to complaints from some drivers - in particular the teenager's late move in defence against Ferrari's Kimi Raikkonen at the Belgian Grand Prix. Horner, speaking to Sky, said Verstappen had been warned he could receive a black and white flag for such behaviour in future. The black and white flag is shown to a driver who is considered to be guilty of unsportsmanlike behaviour. It is shown only once before the driver then receives a black flag, meaning disqualification if the driver does not change his behaviour. Whiting's intervention comes after Raikkonen said Verstappen would cause a major accident "sooner or later" if he did not change his approach. But three-time world champion Sir Jackie Stewart said: "I think he'll come around. He needs a wee talking-to. But that will happen within the team. He's a huge talent." The drivers were expected to discuss the incident in their briefing with Whiting later on Friday but it was not mentioned - almost certainly because it had been dealt with by Whiting already. However, in an interview with the F1 website Lewis Hamilton said: "Max is a quick and fast driver and he is learning. "Most of us at the age of 18 did some silly things too, I am sure of that. He already has a Grand Prix win under his belt and he is an exceptional driver. This is what I see."